Dianne Perham has been designing and crafting glass art for over 25 years. Her studio showroom was established in 1993 in Ottawa. She moved to Ridgeway, Ontario, in 2007 and began a new clientele for studio classes and art commissions. Her passion for glass colours and textures grew into an art with the creation of stained glass windows for homes, churches and businesses. In her studio you will find stained glass leaded panels suitable for hanging in windows, lamps and sun catchers for gift items. Original custom designs for front door entryways, cabinets, or personal requests are also created by Dianne in her studio. 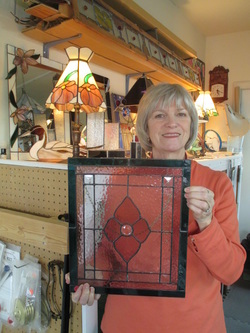 Dianne operates a specialized business where fired stained glass is imported from worldwide manufacturers in many textures and colours in cathedral, opalescent, and antiques. A selection of inventory is carried where equipment, tools and accessories for the stained glass industry are sold. You are welcome to come in to view her creative stained glass art and enjoy the beautiful colours by appointment and/or by chance.